Make your timekeeping more fashionable with this watch from Hugo Boss, with a petite orange strap for comfortable and stylish wearing. The main dial also features diamonds at the 12 o clock mark for a subtle edge of glamour and three additional subdials on the main dial for better timekeeping and an upgraded look. 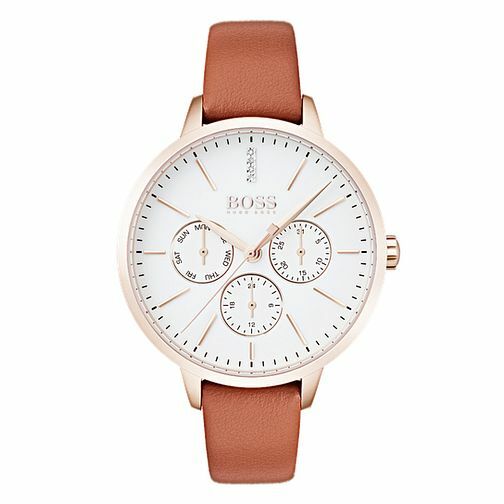 Hugo Boss Symphony Ladies' Rose Gold Tone Orange Strap Watch is rated 5.0 out of 5 by 6. Rated 5 out of 5 by Anonymous from She loved it! She loved it and wears it everyday! It's very elegant and can be worn for all occasions.